(MISSISSAUGA) — Subaru Canada, Inc. (SCI) is pleased to announce that the all-new 2018 Subaru Crosstrek will debut at the New York International Auto Show. The all-new Crosstrek is built on the new Subaru Global Platform and offers enhanced performance, safety, capability, and comfort. The fun-to-drive Crosstrek combines a bold new design with a highly capable chassis for versatility in both off-road and city driving. The more spacious 2018 Crosstrek is the second vehicle built with the brand’s new design language of “Dynamic x Solid.” Multimedia features include standard Apple CarPlay and Android Auto connectivity, as well as Near Field Communication to simplify Bluetooth pairing. Active Torque Vectoring, first introduced on the WRX and WRX STI, is now standard on all trims. The system helps reduce understeer and keeps the vehicle on the driver’s intended cornering path. The new Crosstrek will now be available with a new entry-level Convenience trim, as well as Touring, Sport, and Limited trim levels when it arrives at Subaru retailers this summer. 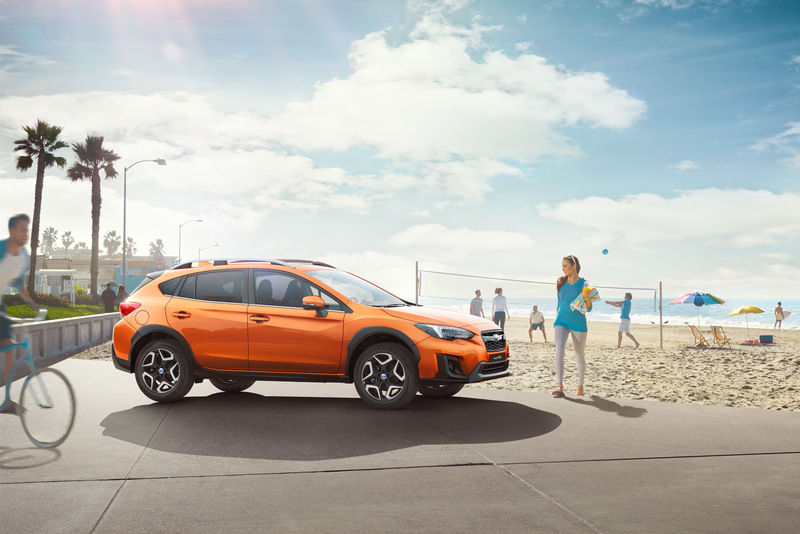 The Crosstrek’s new exterior design incorporates the brand’s signature hexagonal grille and hawk-eye headlights onto a more sculptural body, while its rugged stance is accentuated by prominent wheel arches and flowing lines. Black side- and wheel-arch cladding, lower rocker panels and roof rails provide a sharp contrast to the body colour. The dramatic new look carries into the cabin, with an outward-flow design that follows the front of the car. The 2018 Crosstrek rides on a 2665 mm wheelbase, up 30 mm over the last generation Crosstrek. Just 15mm longer than the outgoing model and 20mm wider, the Crosstrek retains its nimble size but adds an even roomier cabin. With 60/40 split flat-folding rear seats and wider rear gate opening, the 2018 Crosstrek has a larger cargo area for greater utility. The Crosstrek delivers excellent all-around visibility, high ground clearance (221mm), 17-inch alloy wheels and ample interior volume in a nimble yet compact SUV package. The new Subaru Global Platform, together with the SUBARU BOXER engine, Subaru symmetrical full-time All-Wheel Drive (AWD) and EyeSight driver assist technology, represent the brand’s core technologies and constitute the foundation of the next generation of Subaru vehicles. This platform integrates a new framework with optimized cross-sections and highly stiffened joints between structures to significantly enhance safety, straight-line stability, agility, and ride comfort while suppressing noise, vibration, and harshness to a degree not seen before in the small SUV class. Specifically, the new platform increases rigidity of the unitized body structure by over 70 percent. All Lineartronic CVT (continuously variable transmission) trims now come standard with driver-selectable X-Mode to provide better wheel control on slippery surfaces and steep inclines. A lower centre of gravity and revised suspension systems contribute to the biggest ever leap in Subaru’s performance evolution. The double-wishbone independent rear suspension mounts its rear stabilizer bar directly to the body, significantly improving body stiffness and stability compared to the outgoing model. Greater hazard-avoidance capability is another benefit of Subaru Global Platform’s inherent handling agility. In addition, the resolute straight-line stability that makes the 2018 Crosstrek more relaxing to drive is also an important constituent of the autonomous driving capability this platform can support in future Subaru vehicles. Subaru designed the 2018 Crosstrek to provide even higher levels of safety than the outgoing model, which was named an IIHS Top Safety Pick for six years running (when equipped with available EyeSight). The new platform underpinning the 2018 Crosstrek improves crash energy absorption by 40 percent. The EyeSight system includes Adaptive Cruise Control, Automatic Pre-Collision Braking, Lane Departure Warning, and Lane Sway Warning, and includes Lane Keep Assist as a new feature for 2018. Subaru Rear/Side Vehicle Detection is also available. New this year are available Steering Responsive Headlights that illuminate curves for improved visibility, and High Beam Assist that automatically deactivates and reactivates the high beams based on approaching vehicles. All 2018 Crosstrek models include front seat side-impact airbags, side curtain airbags and a driver’s knee airbag. The 2018 Crosstrek offers additional driver-assist technologies, including Reverse Automatic Braking and dynamic guidelines for the rear view camera. Reverse Automatic Braking not only warns drivers of obstacles while reversing, but can also automatically apply the vehicle’s brakes in order to avoid a collision. The 2018 Subaru Crosstrek will be offered in four trim levels: Convenience, Touring, Sport, and Limited. The Convenience starts with an extensive roster of standard features that includes a 6.5-inch multimedia touchscreen, Android Auto and Apple CarPlay, power windows with auto up/down on both driver and passenger sides, 60/40-split fold-down rear seats, cruise control, and heated power side mirrors. It also features standard AWD, Active Torque Vectoring, rear view camera, 17-inch machine finish alloy wheels, integrated roof rails, carpeted floor mats, and privacy glass. The Convenience, Touring and Sport trims come standard with a 6-speed manual transmission or available CVT equipped with X-Mode and Hill Descent control. The Touring trim adds a leather-wrapped steering wheel and shifter, automatic climate control system, 6.3-inch LCD colour multifunction display, heated front seats, windshield wiper de-icer, and fog lights as well as automatic headlights. Stepping up to the Sport trim adds a power driver’s seat, a power moonroof, a premium infotainment system with an 8-inch display, SXM and CD player, Subaru Rear/Side Vehicle Detection, alloy pedals and LED steering responsive headlights.